While the first two studies compare only a small range of products the other two are localised (and study  is probably outdated). Are there more general studies or a consensus that I am not aware of? Which food product chains require more energy? Fish or meat? Burg SWK van den, Taal C, de Boer IJM, Bakker T, Viets TC (2012): Environmental performance of wild-caught North Sea whitefish - A comparison with aquaculture and animal husbandry using LCA. Ellingsen H, Aanondsen SA (2006): Environmental impacts of wild caught cod and farmed salmon - A comparison with chicken. Int. J. Life Cycle Assess. 11, 60–65. Dutilh CE, Kramer KJ (2000). 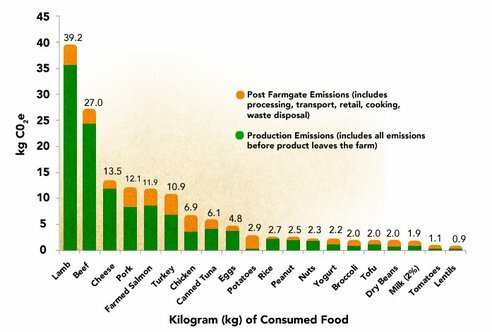 Energy consumption in the food chain - Comparing alternative options in food production and consumption. Ambio J. Hum. Environ. 29, 98–101. Weber CL & Matthews HS (2008): Food-Miles and the relative climate impacts of food choices in the United States. Environ. Sci. Technol. 42, 3508–3513. which I find pretty fascinating — certainly I would have put pork much closer to beef than either salmon or Turkey... really interesting stuff. I'd like to see as well the same graph but per calorie rather than per kg — certainly that would make an interesting relationship between things like rice and tuna. I believe that he talks about locusts emitting less greenhouse gases as well. You can see the chart at about 9:30 into the talk. The whole talk is quite good. Not the answer you're looking for? Browse other questions tagged energy food meat fish or ask your own question. How to source sustainable/ethical meat?